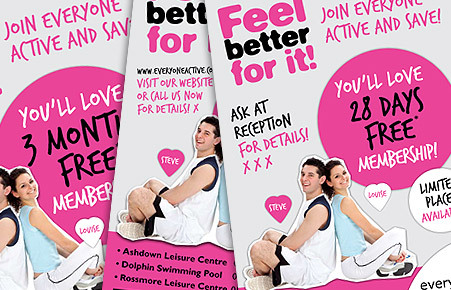 We’ve just completed the latest campaign for our nationwide leisure centre client Everyone Active. Comprising of both online and offline elements we created a loved-up look to attract new customers to our client’s centres. This campaign is the fifth successfully delivered by Wisetiger in 2009-10. Each campaign includes printed flyers, posters and banners plus supporting online content and email marketing. This particular campaign also required specific messages tailored to different geographical regions.